I listened to this Radiolab podcast on my run today (not recommended, I had to stop 3x because my throat started to close up and I couldn’t breathe). It’s the story of a family that lost an infant and donated his organs, then went to find out what had come of the donations. The podcast doesn’t harp on the pain of losing a child (though clearly that’s part of it), but rather their journey to discover the impact the short life of their son had had on the world. At the end (SPOILER), the mother reflects on how those few years of her life changed her perception of…well, everything. Something shifted in me. 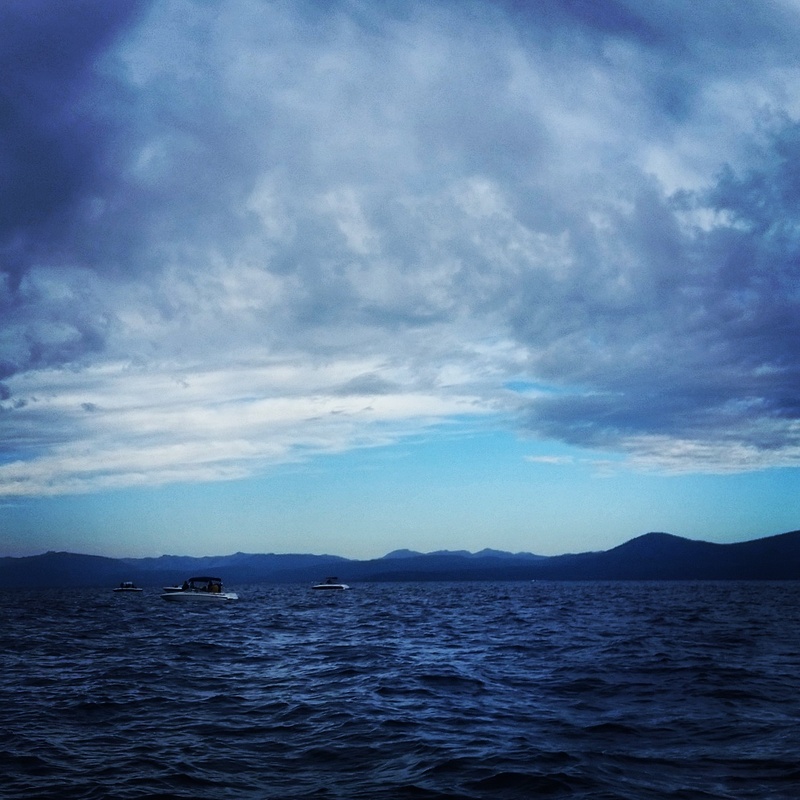 … (Before) I had felt like I was a boat on an ocean that was rocky and choppy with waves. And then I had this feeling that I’m not the boat, I’m the ocean. Like, the decisions that I make are changing other people, as opposed to just I’m a boat being slapped with waves all the time. It has made me feel…powerful. 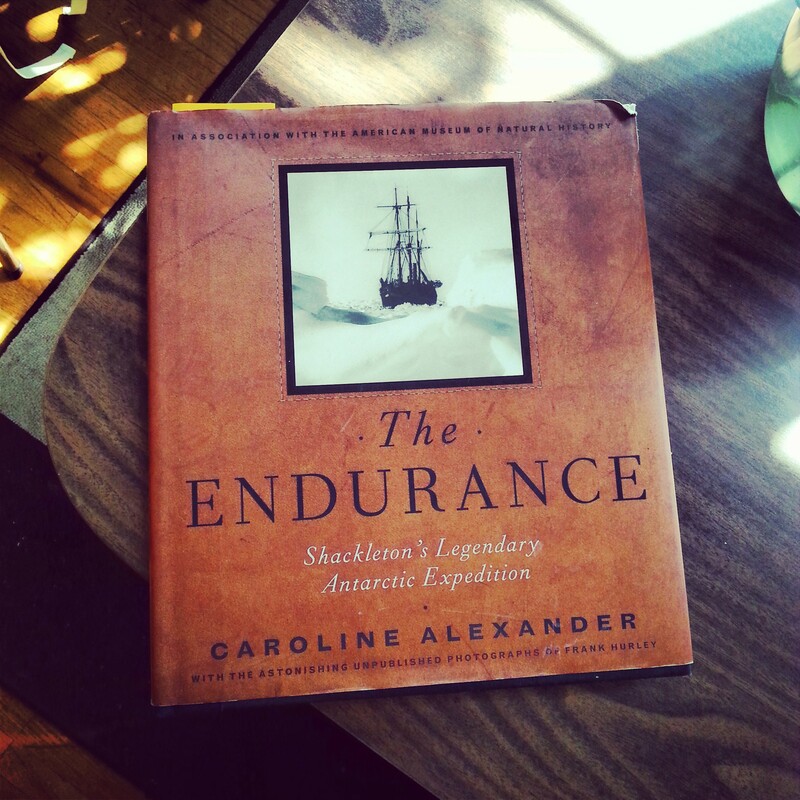 I recently finished reading The Endurance. I really need to stop whining about how cold our house is in the mornings. 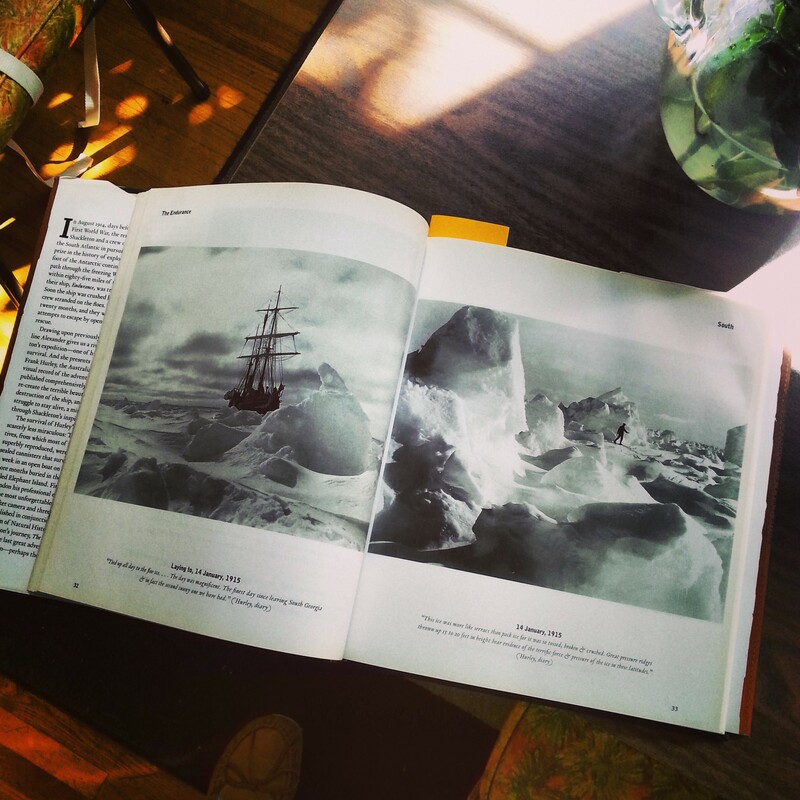 A few years ago I started following a blogger who may have mentioned once or twice that Shackleton is her hero. At the time I was like, pfft, explorer, whatever. Then a few months ago my dad mentioned him and was like, no, seriously, that is a crazy story, it’s such a good book. And I was looking for a book anyway. So I went online to check it out and ordered a used copy for one cent on Amazon Prime. …and this hardcopy behemoth was delivered. But turns out it is actually great, because the photos in there are incredible. Basic synopsis: British explorer attempts to make the first land crossing of the Antarctic continent in 1914. Not something I would have ever picked up on my own. “MEN WANTED: FOR HAZARDOUS JOURNEY. SMALL WAGES, BITTER COLD, LONG MONTHS OF COMPLETE DARKNESS, CONSTANT DANGER, SAFE RETURN DOUBTFUL. HONOUR AND RECOGNITION IN CASE OF SUCCESS. Tim Ferris recently used this to advertise for a personal assistant (true story). The book never mentioned it, and from what I’ve read elsewhere it sounds like there’s no proof that it ever existed. But it’s awesome to think that the crew was made up of people who would respond to that. 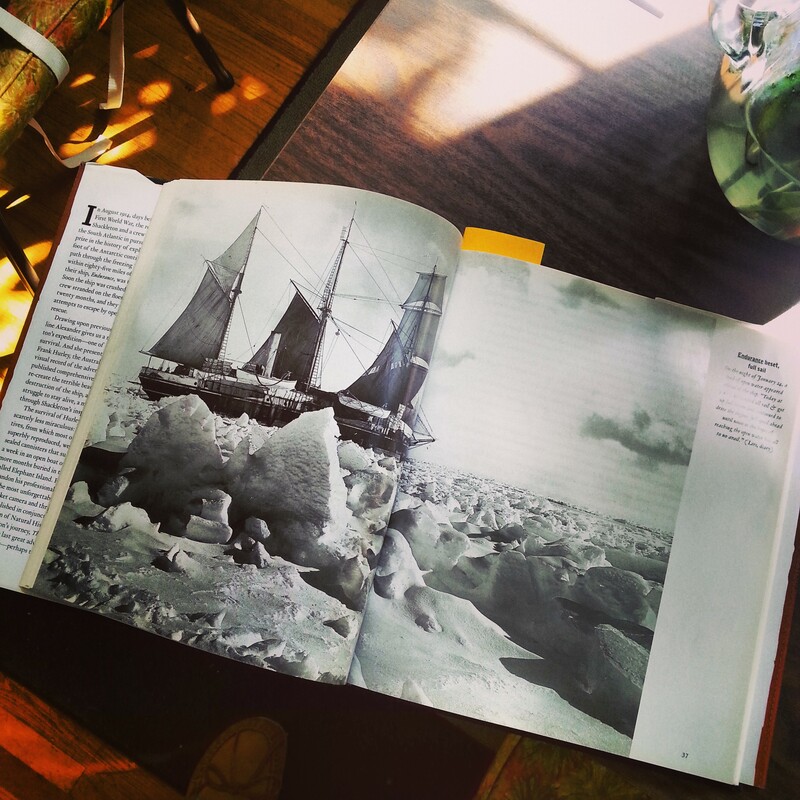 One of the remarkable things about this trip is that in addition to including a photographer, Frank Hurley, on the crew, Shackleton and a large number of the crew kept journals religiously. 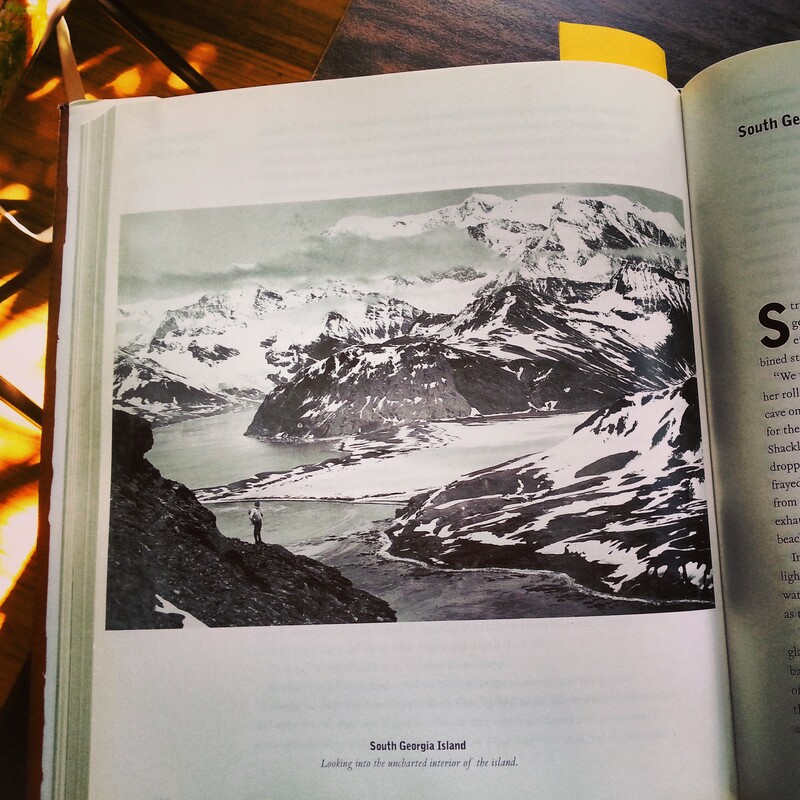 Shackleton had struggled to scrape together the financing for the expedition and had sold exclusive story and film rights prior to his departure, so the trip was documented extensively. When things were looking really, really bad, many continued to write. Even when (SPOILER ALERT!) they had to abandon ship and had to leave behind everything except for emergency provisions, all of the journals and a sizable portion of Hurley’s negatives, as well as his basic photography equipment, were considered important enough to be saved. First: You (or at least, I) would assume that there would only be room for one expedition of this magnitude, with this amount of risk, in a lifetime. 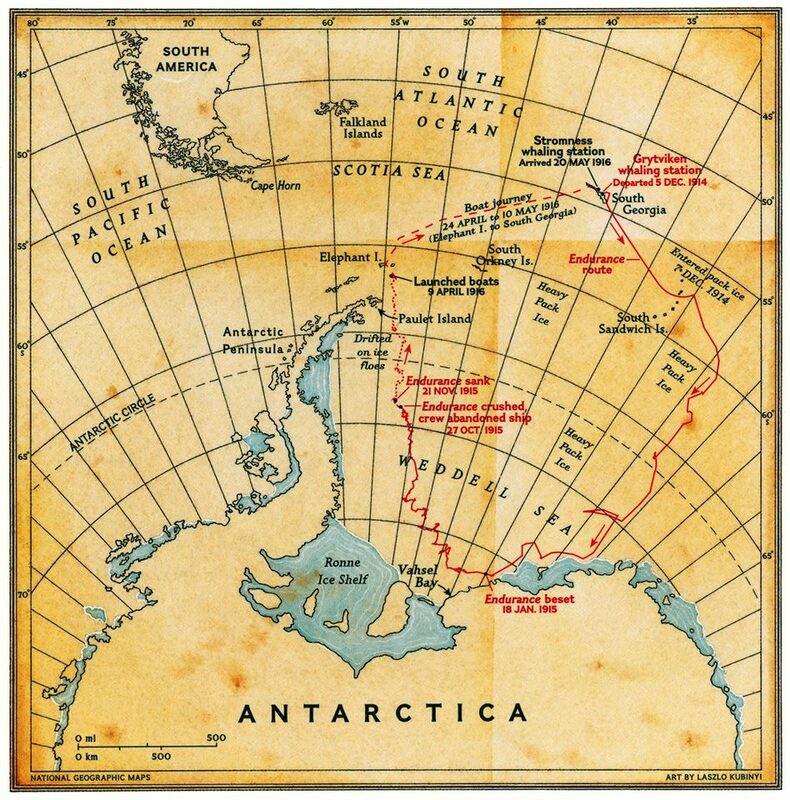 But for Shackleton, and many crew members, this was their second, or third, or FOURTH trip to the south pole. From England. On a boat. In the early 1900s. Following the expedition, a number of them went to fight in the war, then came back and went on even MORE arctic explorations, then finally settled down and led regular lives as pub owners or fishermen. What. Lesson 1: there is time to accomplish a lot of big things in life. Don’t let the magnitude of something stop you from trying. Lesson 2: “Success” redefines itself over time. You never know what it will look like. Lesson 3: How you act really does effect others. Good read. Great story. Check it out. Christmas is done, time for resolutions and new levels of productivity and cleaning up the diet after 2 months of figgy pudding and mashed potatoes and See’s Candies. …and then, three days before New Years, I found out that I’m not going to be able to work out for 2 weeks due to a minor health issue (long story, I’m fine.) Woe is me, time to eat half a pumpkin pie. But after that it was TIME FOR CHANGE. Cleanse the body! Get ahead on work! …but there are a lot of leftovers the week between Christmas and New Years. And a Breaking Bad marathon. January 1st is a better start date anyway. …until a trip to Vons for diaper cream and tortillas on New Years Eve (stocking up for a CRAZY night) resulted in me coming home with a one pound bag of Red Vines. Which I am on track to polish off, by myself, in just under 2 days. So as I sit here on the couch with the first day of the new year already behind us, eating red vines and drinking left over champagne, watching I Love You Man…here’s to better habits in 2015. We can do this. Together. Monday I had a bad day. If I had to rank them, it would be up there with one of the worst days of 2014. 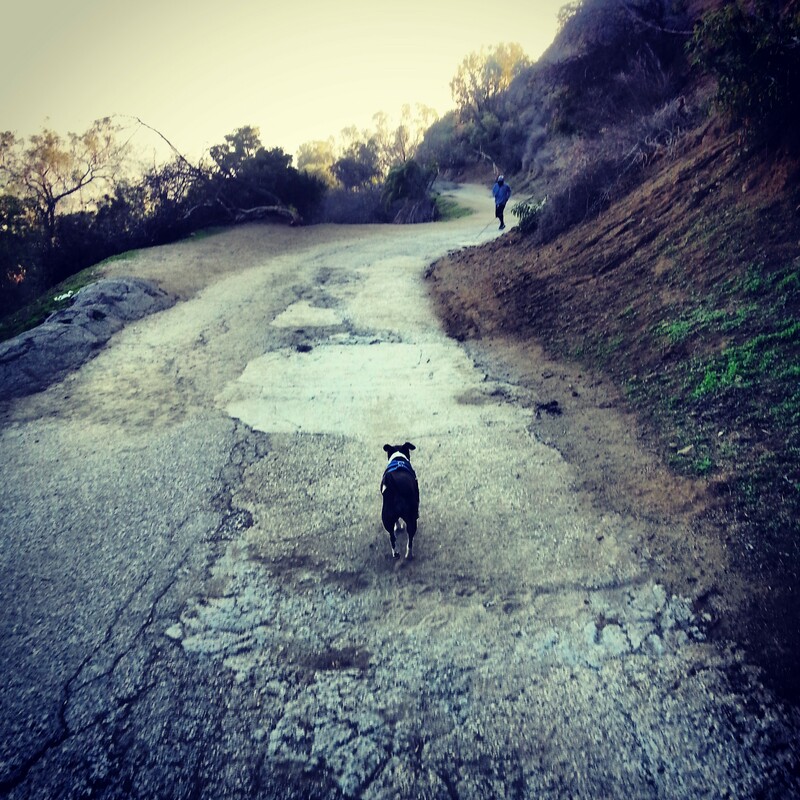 Mid-afternoon I decided I needed to move, so I took Spike up to Runyon Canyon (one of the perks of working from home). It was nice, the views were cool, no celebrity sightings (boo). I was still kind of in a mood on the way home. …and my day got better. Step 1: Since you’ve been a lazy bum the past week, decide to get a good solid swim in before work. Set alarm for nice and early the next day. Step 2: When the alarm goes off at 5:30, decide that in order to really benefit from any exercise you’re going to do that day, you need more sleep. 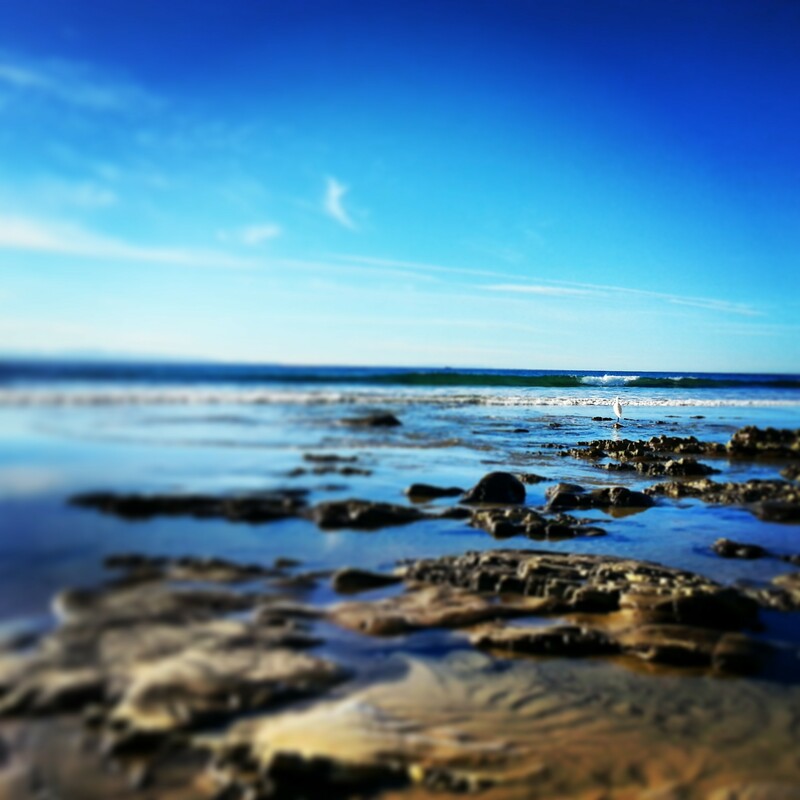 Decide you’ll swim after work. Re-set alarm. Step 3: While at work, realize there is a March Madness basketball game in the arena next to your office at 6pm. Traffic! Make strictly objective call that getting stuck in traffic is really not worth the swim, decide to get home stat after work to avoid the worst of it and do a really good hour of TRX to make up for your lack of swimming today. Step 4: Arrive home. Eat crackers. Eat goldfish. Eat ice cream. Step 5: Sit on couch for just a few minutes to “unwind” (read: watch just one or two episodes of Weeds). Step 6: Realize that it’s almost 7, you’re still in your work clothes, and you haven’t even thought about what you’re making for dinner yet. Step 7: Frantically dig through dirty laundry for 10 minutes because you have no clean sports bras. Step 8: Do 20 min of half-assed TRX, because now it’s like 7:30 and you’re starting to stress about how late it is. Barely break a sweat. Step 9: Change into your PJs with no shower, because people who don’t sweat don’t deserve to shower. Ignore the fact you just spent 30 minutes wearing dirty workout clothes. Step 11: Plan on swimming the next morning before work, since you’ve been a lazy bum all week. Set alarm nice and early. I’ve been sick this week and a little stressed about missing work, which means I haven’t done much aside from sit propped up on the couch with my laptop in my lap and sufferin’ towel on my head moaning. 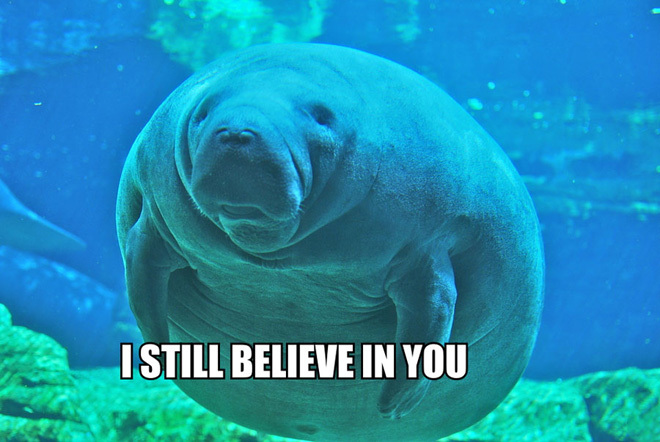 Fortunately I also re-discovered Calming Manatee, who is always there to give you a boost when you’re feeling low. Best therapy on the interwebs. I love this meme. Here’s to a better next week. 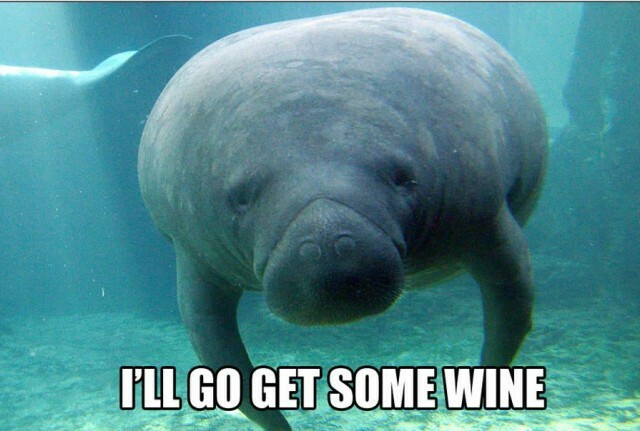 Happy Friday. 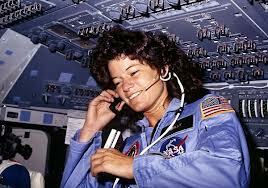 Did you know Sally Ride was 32 when she became the first American woman in space? Badass. You are currently browsing entries tagged with Inspiration at Rambulatory Ambulatory.